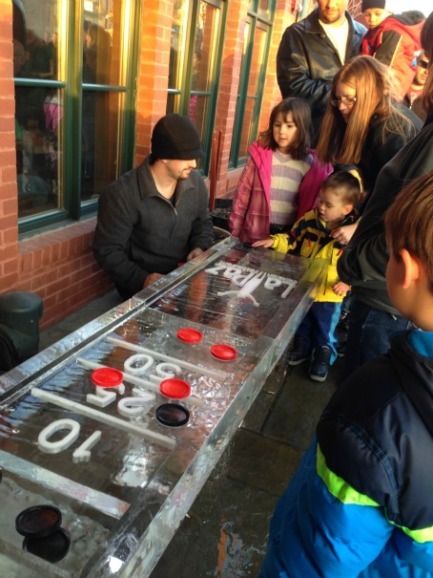 Fire in Ice is one of Frederick’s most popular First Saturday events. 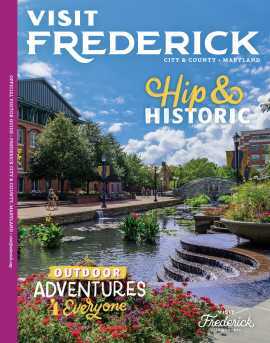 Each February during First Saturday, approximately 75 ice sculptures are displayed in front of participating businesses throughout downtown Frederick. Most sculptures have a theme corresponding to that business and some are even interactive. You’ll find everything from a champagne luge to a decorative ice frame you can stand behind and snap a photo. Click here for a complete list of ice sculptures and locations. If you’ve ever wondered how ice sculptures are created, live ice carving demonstrations will be held from 5-8pm at Brewer’s Alley and from 6-9pm at The Lerner Collection in Everedy Square. 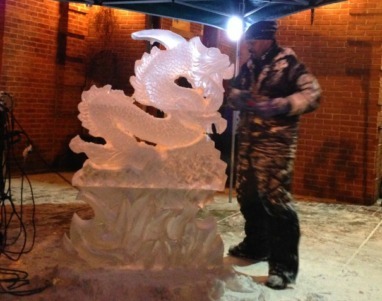 Witness artists transform a block of ice into a work of art. Local fire-dance troupe Pyrophoric promises to take your breath away with an amazing performance at 7pm at the Carroll Creek Trellis. Be sure to take an “Ice Walk” down Carroll Creek to see other Frederick businesses that have sponsored ice sculptures. For guests 21 and older, presenting sponsor Big Cork Vineyards will have a wine tasting from 5:30-8:30pm at 50 Carroll Creek Way*. Everyone has a fun time exploring the Ice Playground at 51 S. Market Street. Get your picture taken on the ice throne, play games, and more. Need to warm up? You’ll find lots of marshmallow roasting being done at s’mores stations around town. Warm your hands by the fire and enjoy a tasty treat and a cup of free hot cocoa. Just like any First Saturday, people can enjoy additional live performances, late shopping hours and numerous special attractions provided by downtown merchants, all of which showcase a spectacular array of food, entertainment, and shopping options.